I woke up early on purpose. My marathon bib entitled me to 50% off the Mirage buffet and I figured with that price I could not totally pig out and still get my money's worth. 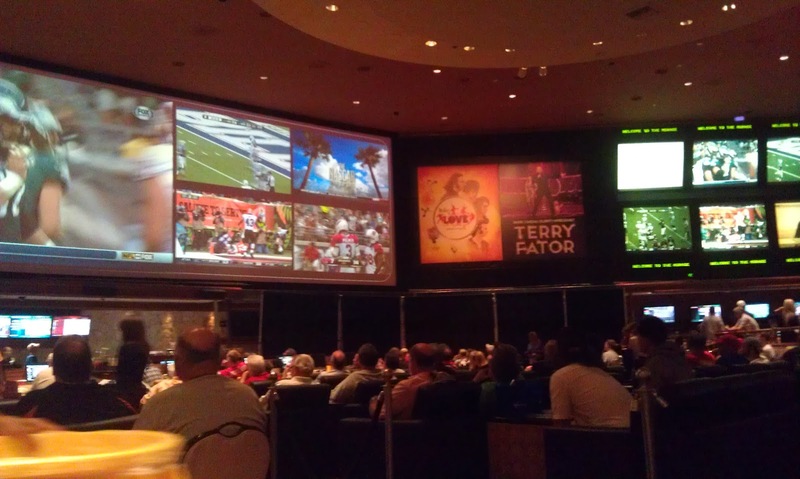 So Sunday morning I headed down to the buffet and ate at the "bar" with a bunch of other guys. I think I paid about $15, which is still a lot of money but considering it was their Sunday champagne brunch, I was getting my meal for a bargain. I kept mostly to starches and ate enough to be full, but I didn't need to waddle out of there like I usually do. 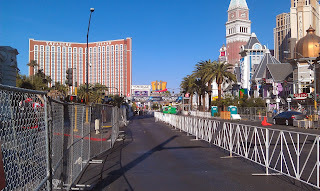 My plan was to lay low, drink plenty of fluids and be ready to jump on the free Mirage shuttle to the race site, which was over near Mandalay Bay. 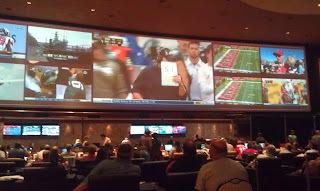 I headed to the sports book and placed 3 bets, I took the Lions over the Steelers (lost), Bears over the Ravens (push) and the Saints over the 49ers (Push). 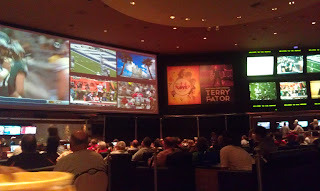 I got their early enough to get a seat and managed to sit through about 3 quarters of the first game. I chatted with anybody who sat next to me, including a guy who worked for Competitor Group -- the owners of the Las Vegas marathon. It was very interesting to hear what goes on in preparation for the marathon ... I suppose if I wasn't involved with computers, working for a group like them would be a blast. 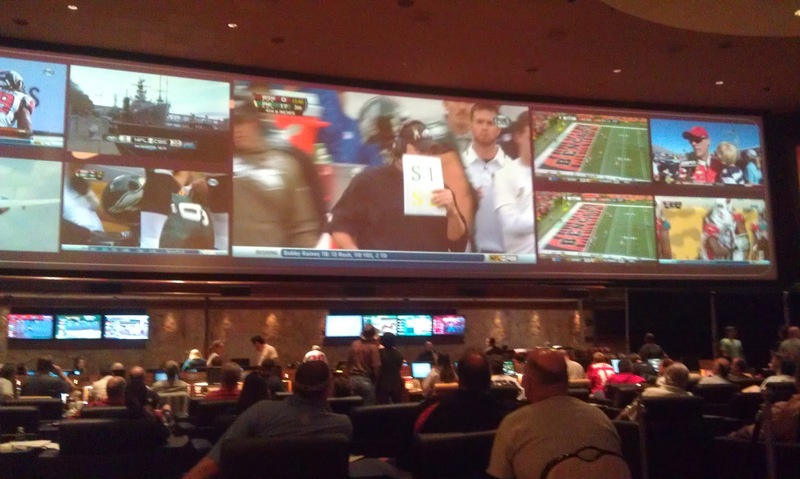 The cigar smoke in the sports book was horrendous (they really should ban them). A little after noon I headed across the street to Casino Royale. They have a Subway sandwich place in the back and I figured no one would know about it. Boy was I wrong. There was a good line-up of about 30 other runners getting in their final meal. They were pretty quick and I managed to get down several helpings of soda and a 6" subway. I kept my food pretty bland as I didn't want stomach issues and I didn't want to be burping up stuff mid-run. I got dressed and headed for the bus, which were starting to leave at 2:30. I got to the bus loading zone a little after 2:30 and I got there just in time. Not 15 minutes after I arrived, hundreds of other people starting showing up. I had to wait about 15 agonizing minutes before the second set of buses arrived (pre race anxiety). I met a guy from Sweden and we swapped running stories. 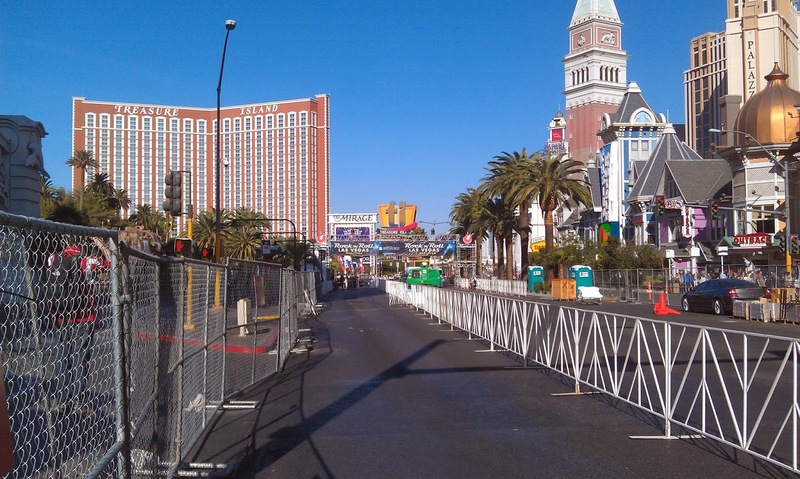 The strip was closed down at that point but the running group did an incredibly wise thing. 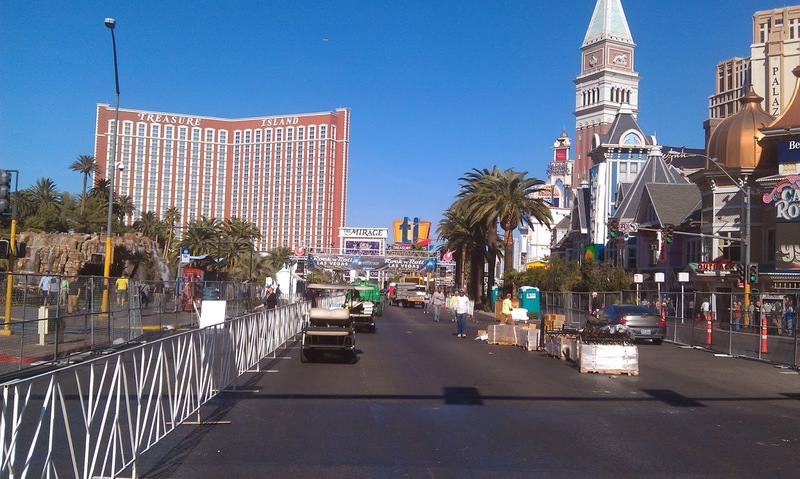 They let the buses run the strip, which made traveling the mile to Mandalay Bay nearly instant. But it was creepy. 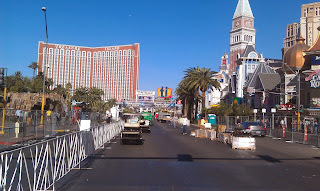 Seeing Las Vegas Blvd completely devoid of traffic made it seem like something out of a Stephen King Novel. This was also the first year they had the band play for everyone before the start of the race. In years passed, they played after or just for the half marathoners. I managed to catch the All American Rejects. I am not a huge fan, but what I heard sounded good. I managed to hit the john twice more and just soaked up the rays of the fast dwindling sun. I met a few people, striking up conversations with anyone who was near, since I was solo at this point.